Once again, we will announce 3 required ingredients before filmmakers have 10 hours to make a movie less than 3 minutes long. This Cinemasports event is open to all ages and nationalities. This is a change from our past Cinemasports Universities events, but the event is based on the same creative spirit. This event is open to everyone, young and and old! Sign up using the button above to receive more information and instructions. Each team will spend a maximum of 10 hours total on their movie. Finished movies must be less than 3 minutes long. Often, shorter movies are more successful and likely to screen internationally. Each movie must include 3 required ingredients announced at the start of the shooting day. Outside of these simple rules, Cinemasports is very flexible. The team size, equipment, and location are all up to each individual team to decide. Most teams will participate on the same weekend: 21 or 22 October 2017. Other teams may participate earlier due to timezone and schedule differences. A gala screening will take place on 25 October on the Kun Shan University campus in Tainan, Taiwan. All submissions will be considered but only a selection may screen due to time constraints. New movie "Does Money Bring Happiness?" by team St. Andrew's School for event 2017 Cinemasports International > UK. St. Andrew's School asks for feedback. New movie "Best friend (Cinema Sports Edit)" by team Lone Buffalo for event 2017 Cinemasports International > Laos. Lone Buffalo asks for feedback. New movie "AGONY." by team Why Not for event 2017 Cinemasports International > Slovenia. Why Not asks for feedback. New movie "Birthday gift" by team 酸甜苦辣 for event 2017 Cinemasports International > Taiwan. New movie "《人心HUMANITY》by 平常心能量" by team 平常心能量 for event 2017 Cinemasports International > Taiwan. New movie "nimitta_沒有做者" by team nimitta for event 2017 Cinemasports International > Taiwan. New movie "Gold Miner" by team 金牌殺手 for event 2017 Cinemasports International > Taiwan. New movie "南台魯味攤-買夢-國際拍片運動" by team 南台魯味攤 for event 2017 Cinemasports International > Taiwan. New movie "陰謀論Conspiracy theory" by team 我們說了算 carteblanche for event 2017 Cinemasports International > Taiwan. 我們說了算 carteblanche asks for feedback. New movie "禮物Gift - 2017國際大學拍片運動Cinemasports Universities" by team 人生好難 for event 2017 Cinemasports International > Taiwan. You are the best gift in my life. New movie "2017拍片運動" by team DEREKIIIIII for event 2017 Cinemasports International > Taiwan. New movie "掃把頭 (BROOM HEAD TEAM FILMING)" by team 掃把頭 for event 2017 Cinemasports International > Taiwan. New movie "【聚魔盒 Murder】" by team 蚌殼精 for event 2017 Cinemasports International > Taiwan. New movie "掃把頭工作室_10秒紀錄片" by team 掃把頭 for event 2017 Cinemasports International > Taiwan. New movie "海邊不要玩手機啦" by team 剪意識團隊 for event 2017 Cinemasports International > Taiwan. New movie "Overload" by team M.A.S for event 2017 Cinemasports International > Taiwan. New movie "第五屆國際拍片運動_地下訪客" by team 高雄黑眼圈 for event 2017 Cinemasports International > Taiwan. New movie "第五屆國際大學拍片運動_錄人甲Shooterby_簡殉" by team 錄人甲 Shooterby for event 2017 Cinemasports International > Taiwan. 錄人甲 Shooterby asks for feedback. 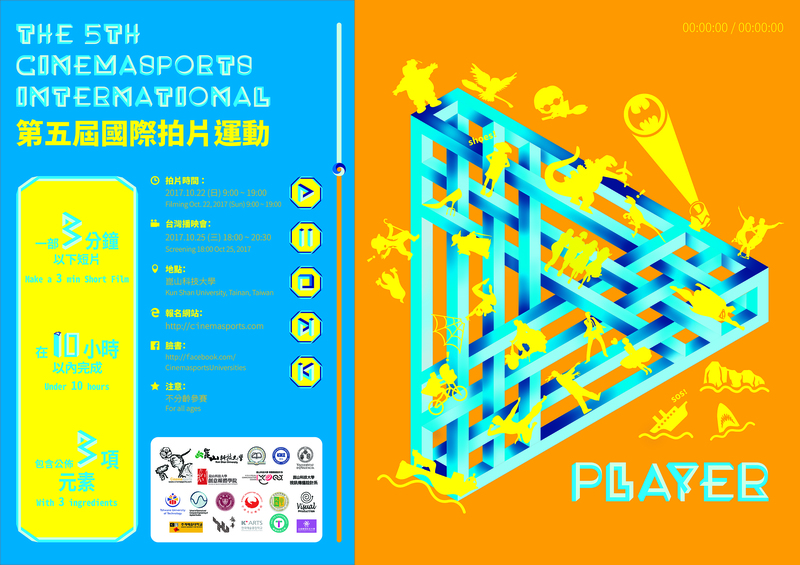 New movie "班長"癮phubber"" by team 班長 for event 2017 Cinemasports International > Taiwan. New movie "Show Hand & Black Jack" by team 九條 for event 2017 Cinemasports International > Taiwan.